Cayey is notable for its surrounding mountains. The city has been actively growing since the 1990s, evidenced by its designation as a Metropolitan Area by the U.S. Census Bureau. It has experienced significant growth in commerce, and many major retailers, such as Wal-Mart have opened stores in the city. Industries in Cayey include sugar, tobacco and poultry. For tobacco there is a well-known company called Consolidated Cigar Corp.  A new coliseum and hospital facilities have also been built. Coca-Cola is a major corporation that has a manufacturing facility in the town. Cayey is also host to one of the campuses of the University of Puerto Rico, the University of Puerto Rico at Cayey. During the first half of the 20th century,  Cayey was basically an agricultural area of small farmers and local haciendas dedicated to the farming of crops for the local market. During the 1920s and 1930s farmers increasingly lost their land to absentee landowners, mostly American companies, that turned to the cultivation of sugar cane and, to a lesser extent, tobacco for export. In the 1950s and 1960s some manufacturing concerns established plants in Cayey taking advantage of tax incentives offered by "Operation Bootstrap", Puerto Rico's industrialization program. Henry Barracks Military Reservation was a lifeline for the residents of Cayey from 1901 to 1966, when it was declared excess land and passed to the General Services Administration for decommission. The property consisted of 439.92 acres ( ). The property was divided into three prominent encampments: the Spanish Camp- Campamento Español (15 acres), Camp Henry or Henry Barracks, the Home of the third Battalion of the 65th Inf. Regiment that consisted of 372 acres, and 67 acres the Cayey Naval Radio Station (67 acres) ). This reservation is situated in the east of the town of Cayey. The Spanish Reservation containing an area of approximately 15 acres, known as Hospital Hill was set apart by Executive Order of June 30, 1903, under an Act of Congress approved on July 7, 1902. The main army post was located in the northern part of the reservation, initially housing the Puerto Rico Volunteer Infantry Regiment. The Foundation for Community Development moved to the housing is located in the southeastern part of the Post until 1972. Thousands of people received training in community development, and leadership during those years. Cayey  is located in a valley surrounded by La Sierra de Cayey, a mountain range where the Carite Forest Reserve is located, and the Cordillera Central, a mountain range that covers most of the central part of Puerto Rico. Because of its location, Cayey is known for its mountains, its cool weather and its misty mornings, especially in winter. During Spanish colonial rule, Spanish soldiers assigned to Puerto Rico were sent to Cayey. Its cool weather resembled the weather of Spain and soldiers could become acclimated to the tropical weather. In winter, it is not unusual for the temperature to drop into the 50s °F. 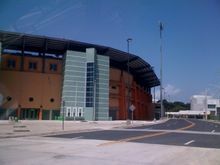 The new Pedro Montañez Municipal Stadium in Cayey, proceeded by the first Pedro Montañez Municipal Stadium in Cayey, is the home of the Toritos de Cayey Double A baseball team,  and the Benigno Fernandez Garcia Jr. High School's field day competitions.